A player has searched for their ball for 5 minutes without success and walks back to where they last played from. Before they reach this spot, a spectator finds their original ball, but under the Definition of Lost Ball they may not continue play with it and must play again from where they last played, under penalty of stroke and distance. A player pulls their tee shot into deep rough. Although they are fairly certain that they will be able to find their ball they don’t want to, because they know that it might be difficult to get it back from where it lies onto the fairway, so they put another ball into play from the teeing ground, under penalty of stroke and distance, without announcing it as a provisional ball. Two players hit their tee shots into the same area and both balls are easily found, but the balls are of the same brand and number and neither player has put an identification mark on their ball. Because neither player can positively identify their ball both are deemed lost, Decision 27/10. A player is certain that their ball is lodged high in a tree and can clearly see a ball in the tree, but cannot positively identify it as their ball. The player’s ball is lost. This is confirmed by Decision 27/15. Q. A player is certain that his ball is lodged high in a tree. He can see a ball in the tree, but he cannot identify it as his ball. Is the player's ball lost, in which case he must proceed under Rule 27-1? 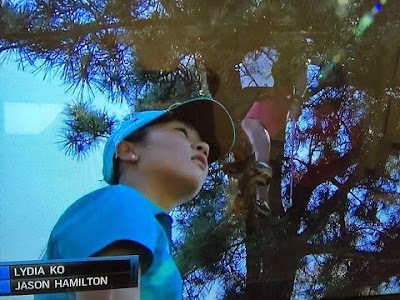 So, in view of that last point, how did Lydia Ko escape a stroke and distance penalty on the 14th hole at the Volunteers of America North Texas Shootout last Thursday, when she hit her ball high into the branches of a tree in front of the green, with hundreds of spectators watching. There is an LPGA video of the whole episode, showing Ko’s caddie climbing the tree and still failing to retrieve or identify the ball at this link, following the ad. I warn you that it is nearly 9 minutes long and there is very little action, but some of the commentary is interesting. The officials involved in the ruling with Lydia Ko today on the 14th hole referenced Decision 27/12 to support their ruling. Due to the fact that it was roughly a 30-yard shot, the spectators were able to see Lydia’s ball from start to finish and therefore provided indisputable evidence that the ball in the tree was indeed Lydia’s ball. Therefore the ball did not need to be identified as it was never lost. The USGA confirmed that in a situation where observers indisputably saw the player’s ball in motion come to rest in a specific location at which the ball remains visible, the ball has been identified as the player’s ball. Thus, since the ball in the tree was deemed as Lydia's ball, she was then able to proceed under Rule 28 – Ball Unplayable. Q. A's ball and B's ball came to rest close together. Neither A nor B could identify one of the balls as his ball because they were using balls with identical markings. A spectator who saw both shots land was able to state which ball belonged to A and which one belonged to B. May his testimony be accepted, or should both balls be deemed lost because they could not be identified by A and B? A. If the Committee determined that, based on information given by the spectator, A and B were able to identify their balls, the balls should not be deemed lost. Otherwise, they would have to proceed under Rule 27-1. Note that Ko was penalised one stroke for deeming her ball in the tree unplayable, but was able to drop a ball within two club-lengths of the point immediately underneath where her ball was at rest in the tree, one of the options afforded by Rule 28. If her ball had not been positively identified by the testimony of the spectators she would have had to return to where she last played from, under penalty of stroke and distance, and would have been faced with the same difficult shot over the tall tree. One last point to remember in similar circumstances is that the player should deem their ball unplayable before shaking the tree to try to recover it. Until the player deems it unplayable the ball is in play and if they, or their caddie, cause it to move they incur a penalty of one stroke, under Rule 18-2a, and would then have to replace the ball where it was in the tree, or deem it unplayable for an additional penalty stroke. If you are viewing this blog on-line and do not already receive them by weekly email, just enter your email address in the top right corner of the web page. There is no charge and you can unsubscribe at any time. I believe there is one other, albeit embarrassing, situation in which a ball might be declared lost ... and it happened to me. My first shot on a par three was far left, bounced high on the cart path and clearly appeared to have kicked left out of bounds. I (foolishly) did not declare a provisional and played a second ball. However, upon arriving at the location of my second ball, also pulled slightly left, I found two balls (!! ), both clearly marked as mine. Since I could not properly identify which ball was the first and which the second, I withdrew from play on the hole (match play). The lesson here is, always declare a provisional ball, however slight the chance you may find your first ball. In this situation it did not matter that you had not announced your second ball as a provisional ball. As you were able to identify both balls as yours, but could not differentiate between them you were entitled to select which ball you would like to continue with, lying 3 (Decision 27/11).